One of the most accurate ways to flame treat a round product is to stop and spin it in front of the flame. 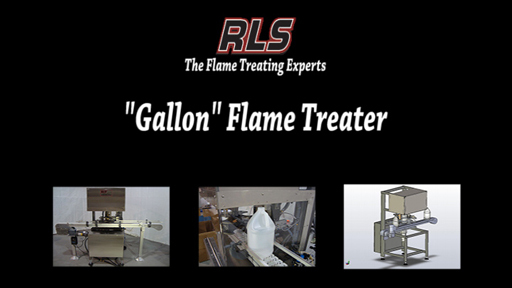 RLS has perfected and standardized a high quality machine that can flame treat most types of one gallon bottles. The product is brought to the unit on either the customer's supplied conveyor or one that RLS can provide to match with the system. The bottle enters the dial and is indexed to the flame with a star wheel. Once in front of the flame, the gate will open and a nose cone will drop to hold the bottle in place. The base plate will spin the bottle a full 360 degrees and close upon completion. The bottle is then indexed out the discharge side as a new bottle is indexed in. These units are so flexible they can even be fitted with a flame bypass to conserve energy when running batches of bottles that do not need treatment. These units are versatile and extremely repeatable. Speeds of 30-60 per minute can be obtained. We can custom fit almost any option to fit your needs, plus provide the latest in safety, guarding, and emergency stops to protect your workforce. These units can be expanded to treat shorter jugs, and the entire concept can be enlarged to flame treat pails, flower pots, canisters, and other large symmetrical round objects. Variation and expandability on this equipment can be found on the RLS Round Plastic Bottle Flame Treating page.